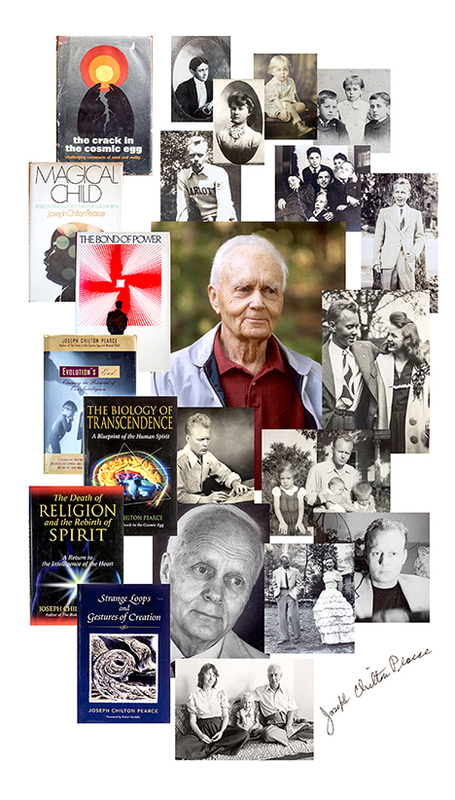 Joseph Chilton Pearce turns 90 today! Most of us worry and fret about our day to day affairs and this dominates our feelings about what life is all about. Beginning at a remarkably early age Joe realized that the game of life is all about discovering and developing capacity. We are creation and creation is a completely open-ended affair. The meaning of life therefore, is what we make of it! And yet, what we make of it is often predetermined by the environment, predominantly the virtual reality we call culture. We begin life by absorbing and becoming that culture. Our true development depends on transcending, reaching beyond the limitations and constraints that culture imposes. 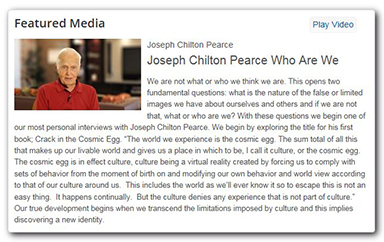 What Joe calls a ‘crack in the cosmic egg,’ cracks in nothing less that our identity-reality, our self-world view opens the door to this open-ended transcendent journey. Joe’s explorations and descriptions of our vast, creative, transcendent human journey is completely unique. Each moment is an act of creation. At ninety years Joe is as focused and passionate about this unfolding of capacity as ever. The game changes with each developmental stage. The last stages rest upon and are shaped by what came before. Our last days are just as formative and creative as our first. In fact, they can be even more so! Joe is savoring these as much as everything that came before by entering into states that are less dependent on the physical body, and what fun he is having. To remind you of Joe’s unique contribution to the field of transcendent human development, one that holds equally the rigors of biology and the vast metaphysical mysteries we call ‘spirit,’ and to celebrate his rich and varied life, we will be sharing segments from one of our most intimate and personal interviews, one a day, beginning to end. The hope is that this will lead you to explore the complete collection in The Joseph Chilton Pearce Library at Touch the Future’s Academy. Joe has no interest in personal praise and accolades. He doesn’t read emails. If you have been touched by Joe’s insights drop him a card and say so. I’m sure he would like to hear from you.